On Saturday night, I felt a "stitch in my side", kind of like the ones you get after running. I rolled onto my stomach as I always did at night to better feel Elsie move. I felt her move enough to satisfy my anxiety and went to sleep. Only a couple of hours later, I was up, tossing and turning. I eventually moved down to the couch because I couldn't sleep. I watched some TV, tired to get comfortable. I kept thinking, " Is this the upper, right quadrant pain they are always mentioning as a caution at my Dr's office?" Surely not. It wasn't pain, just more obnoxious than anything. By 5am Sunday, I had barely slept. I called the hospital to get advice from the nurse. I had been in the previous two Sundays, for worrying about the baby and blood pressure. The doctor on staff advised me to come in and get checked out...better safe than sorry. I reached the hospital, went to L&D triage (where they decide if you are "actually" in labor). I got hooked up to the machines to monitor Elsie, got labs drawn, and sat to await the results. Previous experience had told me it would be about an hour. The Dr. who I had spoken to on the phone came in and advised me that my labs had in fact increased from the two days prior, when I had them taken at my doctor's office. She said they were high enough to be concerning. She was admitting me. She told me that I wouldn't be going home until the baby was born, but she was going to watch me throughout the day to see if the proteins were increasing slowly or quickly. I called Ryan to come up and called my sister, Natalie to pick up Zoe. I was moved over to L&D, given an IV (the worst), and again, sat to wait. During this time, I had called my uncle, Chris to have him come to the hospital to help administer a priesthood blessing to myself and Ryan. Because I was possibly going into labor they wouldn't let me eat or drink. At about noon, they decided to let me have some ice chips, because they had started me on magnesium, and I was extremely thirsty. Elsie's vitals looked mostly good. 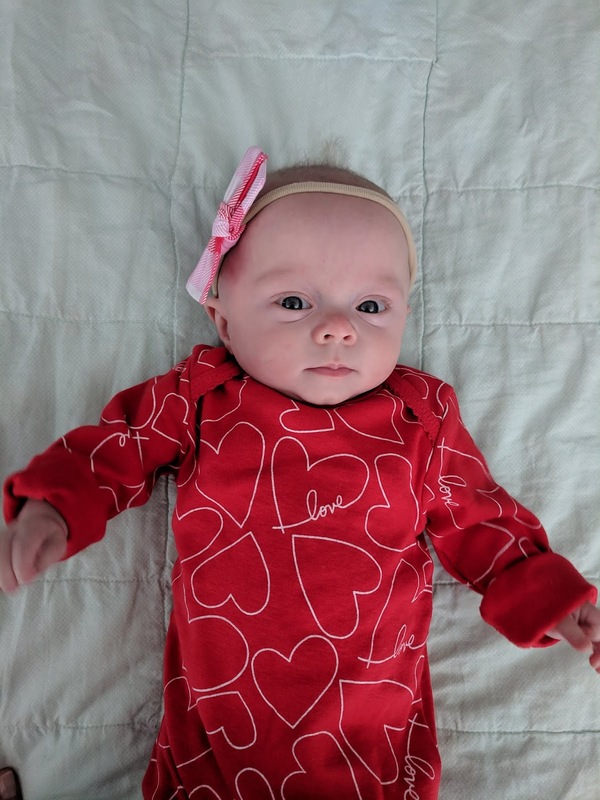 We had a couple of deceleration's during this time that indicated she might be stressed, but otherwise she looked really good, lots of movement and good heart rate. The next 30 minutes was chaos. I called my parents, Ryan called his parents. I video-called Zoe. I was really scared. 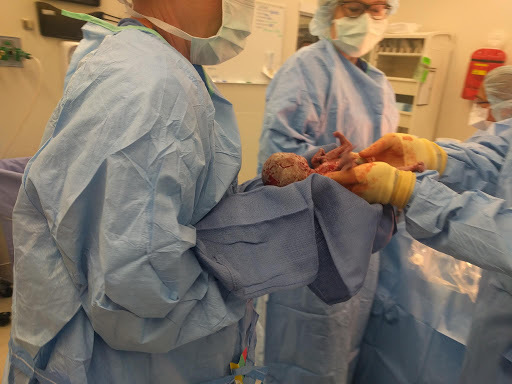 I was more scared of the c-section, than having a 1.5 lb baby. The anesthesiologist gave me an additional IV, in case of an emergency so they could put me under quickly. 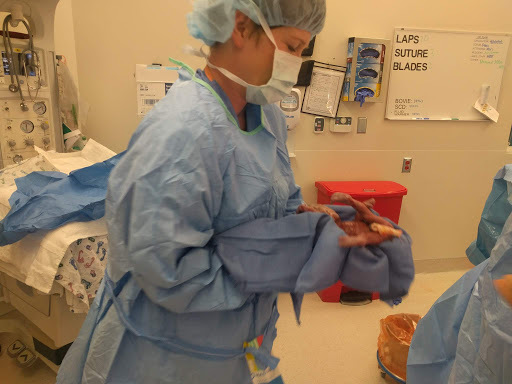 We moved into the OR. Ryan was in another room, scrubbing up so he could join me in the OR. A kind nurse helped me sit extremely still while I was given a spinal block. By the time Ryan came in the spinal block was already working. I couldn't see him as I was lying flat, but he was talking to me and reassuring me. I was stunned, I didn't know they had even started cutting. The first thing I asked was, "What color is her hair?" They kindly replied, " Sweetie, she doesn't have any." 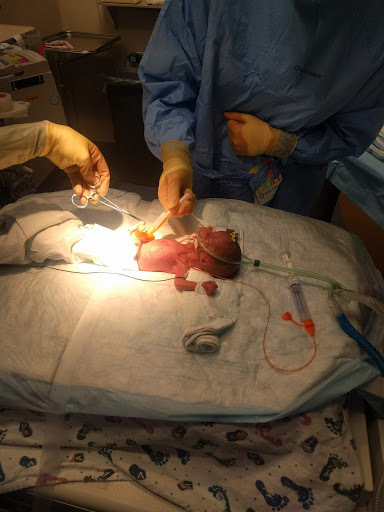 They immediately passed her through a window in the operating room, to the NICU. Ryan couldn't go with her, until after they had stabilized her, he stayed with me while I got stitched up. This process was the worst part of the c-section. I felt like I was riding an old, rickety wooden roller coaster. Up and down, left and right, I was pulled in all kinds of directions. Because of the HELLP Syndrome, I had to remain on magnesium for 24 hours after my delivery. Magnesium makes you have all kinds of awful side effects, hot flashes, weakness, nausea, etc. This meant I couldn't go see Elsie until I was able to get out of bed. There wasn't room in the NICU to accommodate a wheeled hospital bed, I had to be in a wheelchair. Before they had finished stitching me up, they came to get Ryan and bring him to the NICU to see Elsie. They finished putting me back together and wheeled me to my room. In my room it was quiet. Ryan was still with Elsie, and I was alone. Despite just having surgery, resulting in the birth of a baby, it felt oddly uneventful. I had just had a baby, but nothing had really changed. I was still numb from the surgery, so the pain hadn't set in. I hadn't even seen my baby. It was an strange and surreal time for me. Thankfully soon after, Ryan returned to my room with a report. Elsie was doing well! A NICU nurse, Alisa, came with him and brought pictures. She came out breathing on her own, but they put her on CPAP to help her tiny body. Over and over they kept reassuring me that she was doing surprisingly well. Ryan didn't stay the night. We both knew he wouldn't get very good sleep and there would be nurses coming in every couple of hours to take my vitals and administer medicine. I sent him home so at least one of us would have a good night's rest. The next morning, early in the morning, I was determined to see Elsie. I mustered up some kind of strength and was able to get into a wheelchair. My kind night nurse wheeled me in to see Elsie. I was still so sick from the magnesium but I couldn't wait any long to see her. I only stayed by her bed for 30 seconds, maybe a minute, before I was light-headed and needed to go back to bed. She was SO tiny. Tiny doesn't even begin to describe her size really. 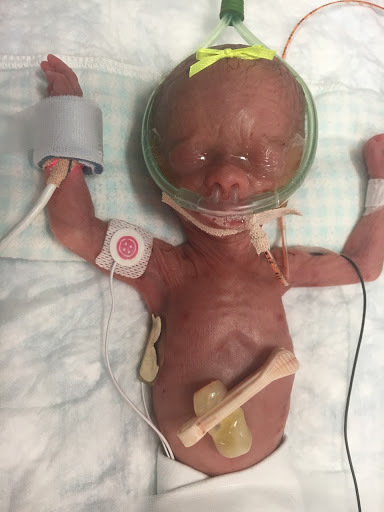 Until you have witnessed a baby that small, it seems truly impossible that a person that small could survive. What is almost more impossible than survival...is just 5 months later, she looks like this. We never expected to have another child. Truly, we thought it an impossibility. Elsie has proven that miracles are real. Her existence alone is proof. Beyond just existence is her growth and strength, that are truly miraculous. She should suffer from many afflictions due to her pre-maturity and placental issues. Yet, other than her petite size, she is un-phased.